Working with Elance Online—an online marketplace that helps small businesses outsource almost any type of project—we’ve talked with dozens of buyers who have successfully outsourced projects as diverse as administrative support, business strategy, graphic design, web design and development, writing and even software development. When talking to buyers who’ve mastered the art of effectively managing external service providers, the same themes emerge over and over. We’ve distilled their advice into the following “Top 10 Best Practices” for working with external service providers. 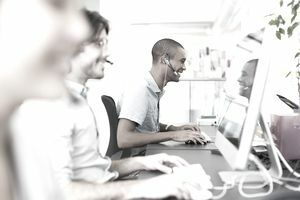 Following this advice can help you get the most out of your relationships with external vendors or contractors -- whether you use the web to find service providers or are requesting and evaluating quotes from vendors the “old fashioned” way. This might seem obvious, but any successful outsourced project always starts with a clear statement of what you are hoping to accomplish. Define your project requirements up front. Service providers need accurate, complete information to present you with realistic proposals and to quote you a reasonable price. Be specific about the deliverables you expect the vendor ​to provide. Give vendors as much information as you can about what you need delivered and the way in which you need the work done. Also, be clear and realistic about your schedule requirements - project schedules can have a huge impact on project costs. Ideally, the service provider you select will have specific experience with the type of project that you’re undertaking. You don’t want to be somebody’s “guinea pig.” This is especially crucial when outsourcing complex technical projects such as software development. For example, if you’re looking for someone to develop an application for the iPhone, make sure they’ve actually completed commercial projects on that platform for other satisfied customers. This advice holds true for other types of projects as well. If you need a business plan for opening a retail store, you’ll get best results if the consultant you hire has verifiable experience in the retail sector. Examine the vendor’s previous work (their “portfolio”) and make sure that their previous work meets your expectations for quality and style. If you’ve evaluated a vendor’s portfolio, references, and previous experience and are still unsure of their capabilities, consider asking them to do a quick mock-up or provide a basic outline of a work plan. A service provider who really wants to win your business might be able to give you a rough concept so you can better understand their approach to solving your problem. But never cross the line between asking for a mock-up and insisting that a vendor provide you with finished work “on spec.” No qualified professional expects to work for free. For technology projects, it’s a good idea to specify a warranty or support clause so that you are assured of some amount of continuing support from the vendor after the project is complete. It’s much easer to negotiate a support clause before the service provider begins work, rather than after the completion of the project. Even creative or business services can benefit from a support clause. Suppose you need some changes to a business plan based on feedback that you get from potential investors. Or maybe you find that you need that snazzy new logo delivered in a new type of file format. Specifying some amount of free support or negotiating discounted prices for future modifications can save you time, money and headaches later on. You can access top-notch expertise any time you need it without the overhead of hiring full-time staff. By staying focused on your core competencies and hiring expert freelancers for your other needs, you can compete with the delivery capabilities of larger organizations while maintaining your independence.